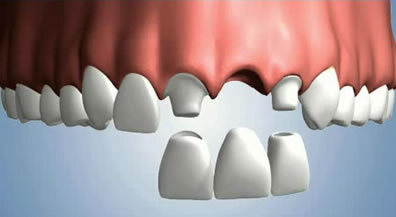 A bridge is one of many options for replacing a missing tooth. First, there must be a tooth on either side of the space to anchor the bridge. These anchor teeth are prepared to accept a covering, like a crown, and have a fake tooth fused between them to look like a natural tooth. The bridge is permanently cemented in place. Two appointments are needed to complete the bridge. The first appointment the teeth are prepared and an impression is taken to send to the lab. We make a temporary bridge for you while we wait for the bridge to come back from the lab. This usually takes two weeks. At the second appointment we remove the temporary and seat the permanent bridge. Extra effort is needed to clean under the bridge to prevent decay at the margin of the natural tooth.